Head into the holiday season with a clear vision of what success looks like for you. This will give you a north star when you’re making decisions about where, when and if you’d like to indulge. Where are you in your journey and how would you like to feel on January 1st when the hustle and bustle of the holiday season ends? If you have a competition, need to make weight or want to stay as dialed in as possible, maybe you focus on fun, not food this holiday season! Or, maybe your goal is to maintain and cut yourself some slack to allow for a few more Christmas cookies. That’s cool too and there’s no right or wrong answer. This definition of success will allow you to clearly assess if your actions are bringing you closer or further from this vision. Then, you can tweak and change behavior accordingly! Grab a calendar, write down all of your engagements and commitments and prioritize! Depending on the vision you’ve created and the level of flexibility that vision allows, you can decide which holiday events are most important to you. ~What foods can you get any time of the year? Think store-bought brownies at the office party. ~Which foods are truly special and only come around during the holidays? Think grandma’s Thanksgiving pumpkin pie or your Aunt’s special sugar cookies. ~When will it be easiest to stay on track? Think restaurant meals with menu options or potlucks that allow you to pick what goes on your plate. ~When would you like to be more lenient? These are probably the occasions when those special foods may be around! Think the biggest. Once you have the dates laid out, decide where and when you want to indulge and when it makes the most sense to stick to the healthiest options possible. Consistency over time is where the magic happens. 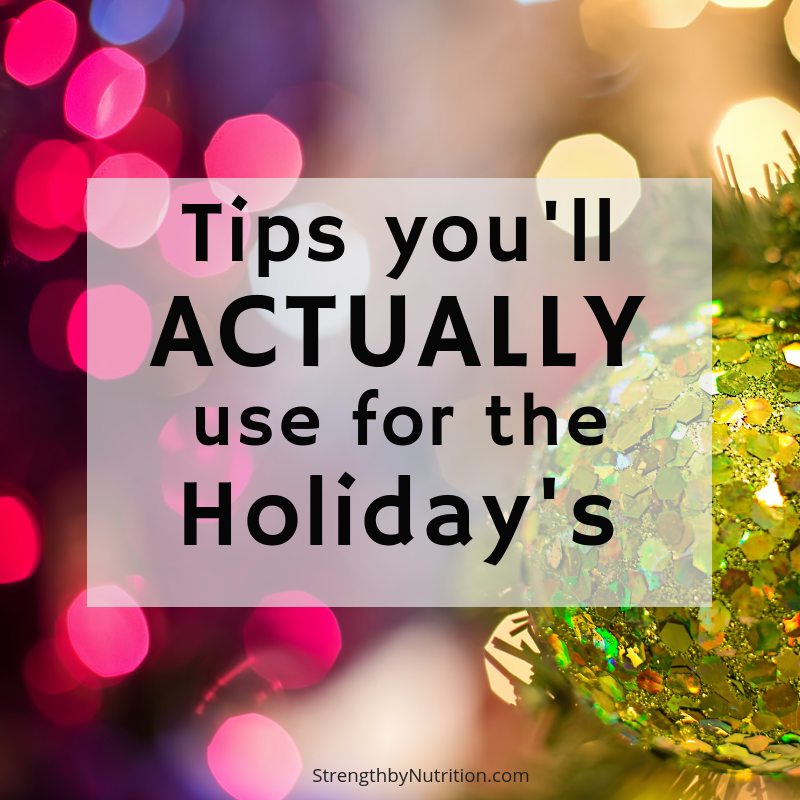 To ensure that a few more indulgent meals don’t add up and slow down your journey to your goals, optimize the days when you don’t have much going on and really commit to making healthy choices that fuel your body. Partner, friend, coach (nutrition, lifestyle or athletic!) you name it! Enrolling others will let them hold you accountable when you’re needing a little extra support to stick with it. As an added bonus, telling others about your goals will also make them more real for you. Step 5: Trust (and Be Kind to) Yourself. No one is perfect and it’s important to remember that balance and flexibility are necessary parts of any lifestyle habit that is going to stick long term. Remember that the hard work you’ve been putting into getting to know your body and what makes it tick isn’t going anywhere this season and it will always be there for you to come back to!